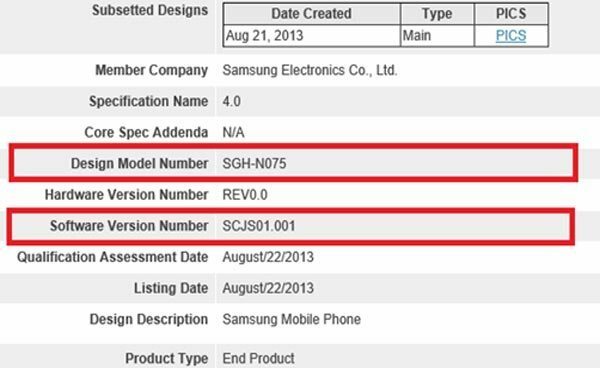 It is obvious we would see more official Samsung Galaxy Note 3 confirmation considering the expected launch event is just over a week away, but seeing Bluetooth certification this early before a Galaxy Note 3 release date surprised us. This might mean a much earlier global rollout than some people originally thought. We know the Samsung Galaxy Note 3 is in final certification steps thanks to an image landing on this blog that reveals the handset with a model number SGH-N075. This Bluetooth certification is for NTT DoCoMo, a Japanese carrier, so while the phablet wouldn’t necessarily be looming right now it is being signaled with a earlier release date when compared to last year. Samsung Galaxy Note 3 specs and features are yet to be confirmed officially, although a number of leaks have painted a pretty good picture on what to expect. The main specification should include 3GB of RAM, a 13MP camera, and 5.7-inch display at 1080p, Android 4.3 and Exynos 5 Octa or Snapdragon 800 processors. The processor specs have caused a little debate of late thanks to recent leaks pointing to limitations for different parts of the world, which would mean some people might need to choose between Octa and LTE. We published an update on the Galaxy Note 3 colors and CPU rollout only yesterday. This reveals some problems with overheating during initial tests of Octa models, so those areas planned for a Snapdragon 800 rollout might see the phablet launch much sooner than others. You can see the Bluetooth certification image below that reveals a qualification assessment date of August 22, although the report was first created on August 21. How excited are you for the looming Samsung Galaxy Note 3 release date? I am definitely happy and ready for day purchase of the Galaxy Note 3. I been saving my Verizon upgrade for this phone. I really need a new phone as my droid 2 R2D@ Edition is not acting right anymore.